Resale Value for boutiques and shops: $100.00 per pack. 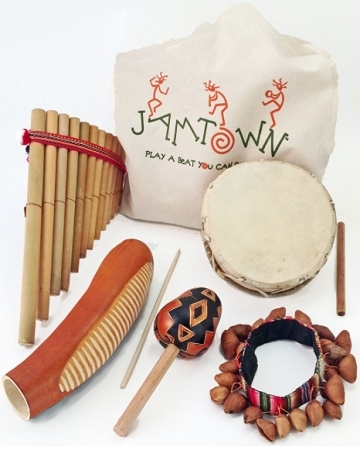 Jamtown musical instruments deliver great sound and a cultural connection to your classroom or family room. Authentic and handmade, each instrument is comprised of raw materials from the continent and assembled in the traditional manner by small producer groups, typically families that have been making similar instruments for generations. The story behind each instrument is included with information about the raw materials and production process. A sturdy travel bag keeps your pack ready to go and provides extra room to grow your collection.